Varnished Gum ( Eucalyptus vernicosa, MYRTACEAE ). 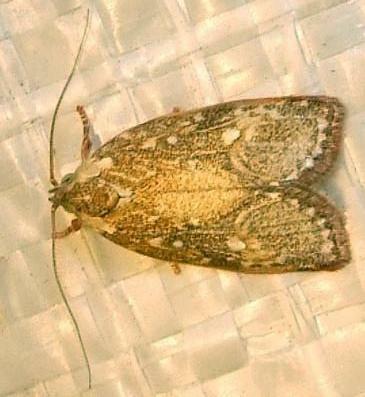 The adult moth of this species has forewings with a lacey brown pattern on pale yellow. The hindwings are plain yellow. The moths have a wing span of about 2.5 cms. Melbourne University Press, 1990, figs. 13.1, 13.2, pl. 4.8, p. 222. CSIRO Publishing, 1994, pp. 268-270. Volume 7, Part 4 (1883), p. 486.